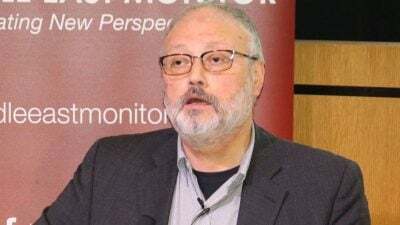 The October 2 murder of the Saudi journalist and Washington Post columnist Jamal Khashoggi continues to dominate international headlines nearly two months later, in ways that few stories outside of the United States and Europe ever do. Grisly as the death evidently was, it is difficult to rationalize the outcry as an outpouring of humanitarian sentiment alone, given the far more significant three years long assault on Yemen has mostly failed to register on the public consciousness until recently. Whitney Webb revealed in two recent October articles that the Khashoggi murder is being exploited by the US for reasons that have more to do with the US military industrial complex and economic windfalls, than with serious concerns about the kingdom’s human rights record. In the following exclusive interview for GRTV, Webb talks about MBS’s apparent abandonment of America’s THAAD anti-missile system in favour of the Russian S-400 system, the reneging on a privatization scheme, and her conjecture about last summer’s Saudi-Canadian spat being rooted in international oil politics. Whitney Webb is a staff writer with Mint Press News. Her work has appeared on Global Research, the Ron Paul Institute and 21st Century Wire, among others. She has also made radio and TV appearances on RT and Sputnik. She currently lives with her family in southern Chile. Global Research: Something that you raised in your October 15th article, talking about how this murder took place only two days after the expiration of an agreement to purchase a number of THAAD missiles from the United States. Could you maybe help address that link between those two events? Whitney Webb: So that report has to do with the fact there was a September 30th deadline for Saudi Arabia to commit to buying $15 billion worth of products from Lockheed Martin, mainly the Terminal High Altitude Air Defense system, or the THAAD system, and that was part of a larger weapons deal that President Trump has promoted really for over a year – the $110 billion weapons deal. But he’s really, you know – weapons sales, Trump has made a cornerstone of his foreign policy as president. And one of the major successes of him selling arms to other countries abroad has sort of been for him in terms of him promoting this – this $110 billion weapons deal. But it turns out that deal was never finalized. Instead it was a series of letters of intent, letters of interest that the Saudis gave to the US and US arms manufacturers regarding different – different things that they planned to purchase in the future. But however, from that point to the present, what has happened is that the Saudis haven’t really followed through with their previous letters of intent and interest, and this happened in the case of this $15 billion planned purchase. That deadline was on September 30th, and that was two days before Jamal Khashoggi entered the consulate never to leave. Instead of signing on the dotted line on that deadline, they just let the deadline pass. Subsequently, when it came out that they had not signed the deadline, they tried to say that they – a Saudi official told the Washington Post that they still had … they were highly interested in buying the system still. But, it’s important to point out here that Saudi Arabia last year, after the weapons deal and all these letters of intent and things were signed, that they had made plans and admitted their plans to buy the S-400 – the Russian equivalent of Lockheed’s THAAD, and this was finalized – this was mentioned again in September – earlier in September, around September 20th or 21st that they were planning to follow through with the purchase of the Russian equivalent. And this is notable because China was recently sanctioned by the US for buying the S-400, and when that happened the Saudi Ambassador to Russia notably brought up that he was concerned that they could face US sanctions over their upcoming and planed purchase of the S-400. Ad what’s interesting here is that part of the consequences that are being promoted in the US mainstream to sort of, you know, punish MBS and Saudi Arabia for Khashoggi’s murder, you know, are sanctions. So it seems that the military industrial complex which – or Lockheed Martin at least, which was obviously disappointed in the Saudis’ decision to not buy American and to buy Russian instead – they may be getting their sanctions after all, but under a very different premise. GR: I notice also that your – in your subsequent article, you mention the prospect of bin Salman (MBS) having essentially pledged a major privatization scheme that would have been a major windfall for not just the … military contractors, but investors in the US and potentially elsewhere. Could you elaborate on that aspect? WW: Back before MBS became Crown Prince, which was last June, he had teased in a pretty wide ranging article with The Economist, which the Rothschild banking family for example – they have openly claimed to be custodians of that paper – they own a significant number of the shares. Um, MBS basically announced that he was planning – that he had ambitions to privatize large parts of the Saudi public sector, which basically – if you’re going to put that in The Economist, it makes it pretty clear to the international financial elite that you’re willing to support what your plans are. And this is significant because of the older class of the Saudi royals, including Mohammed bin Nayef who was the Crown Prince MBS eventually deposed. They were against this privatization because they know that it can lead to instability because… such a significant portion of the Saudi population are dependent on welfare from the Saudi State. A lot of them work in public sector jobs. Obviously any cuts or privatization of that would end those cushy public sector jobs, and there’s also all these fuel subsidies, these tax cuts that people there have grown accustomed to. So basically what has happened is that MBS, when he wasn’t Crown Prince, he sort of may – and his plan for this privatization was called Vision 2030, and it was sort of promoted in at least the Western press as a means to sort of wean off Saudi Arabia of its oil dependency, but it was really a lot more than that. I mean … it’s a neoliberal free-for-all. The mass privatization of Saudi public sector infrastructure and things like that and in addition to partial privatization of the Saudi State oil company Aramco, which was supposed to happen as part of the Saudi Aramco IPO um it’s notable that that – er Initial Public Offering – and it’s notable that the Initial Public Offering was cancelled just a few weeks – I think around six weeks before Khashoggi’s disappearance – and since then, MBS had tried to sort of assuage a lot of the banks that end up losing out on money as a result of the cancellation on that because they had worked on that Saudi Aramco IPO, planning to be paid when the deal was finalized, as was often the case with these sort of big deals. So essentially, MBS’s more or less last minute decision to cancel the IPO – well he put it on hold indefinitely, but he basically cancelled it, basically made that all of these banks including Goldman Sachs, CitiGroup and the like had been forced to work for free – which was kind of ironic, considering that these banks … you know have made their fortunes exploiting other people – they themselves sort of became inadvertently exploited because MBS sort of backed out of these privatization plans. And it’s not really hard to understand why MBS got cold feet, because there’s a reason why, you know, the Saudi royal classes resisted privatization up until this point. Basically this happened earlier this year in January. They tried to sort of begin to implement some of the parts of Vision 2030, which also includes some austerity packages and they got a hugely negative response as a result. And they ended up trying – they were cutting fuel subsidies for example, and they had raised taxes, and they immediately reversed – well not immediately, but within less than a week, they reversed … pretty much all of them and that even reversing them was not enough to quell the public outrage. They eventually fired some government ministers to try and absorb, you know, the public upset as a result. And I think, you know, that really, really must have spooked MBS, because he was, you know, facing the potential for a lot of domestic unrest over these policies that are really popular with the Saudi public. And I think he realized that not only would that put his position as Crown Prince in peril but it could actually potentially damage, you know, the whole of the House of Saud in general, and Saudi Arabia.